Steve Blank What’s A Startup? First Principles. What’s A Startup? First Principles. Everyone knows what a startup is for – don’t they? In this post we’re going to offer a new definition of why startups exist: a startup is an organization formed to search for a repeatable and scalable business model. Ok, but what is a business model? 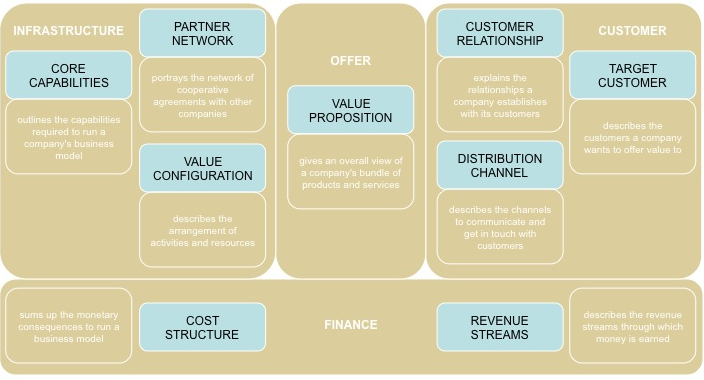 A business model describes how your company creates, delivers and captures value. Or in English: A business model describes how your company makes money. Think of a business model as a drawing that shows all the flows between the different parts of your company. A business model diagram also shows how the product gets distributed to your customers and how money flows back into your company. And it shows your company’s cost structures, how each department interacts with the others and where your company fits with other companies or partners to implement your business. While this is a mouthful, it’s a lot easier to draw. Lots of people have been working on how to diagram and draw a business. I had my students drawing theirs for years, but Alexander Osterwalder’s work on business models is the clearest description I’ve read in the last decade. The diagram below is his Business Model template. In your startup’s business model, the boxes will have specific details of your company’s strategy. But What Does a Business Model Have to Do With My Startup? 2) a series of hypotheses about all the pieces of the business model: Who are the customers/users? What’s the distribution channel. How do we price and position the product? How do we create end user demand? Who are our partners? Where/how do we build the product? How do we finance the company, etc. Your job as a founder is to quickly validate whether the model is correct by seeing if customers behave as your model predicts. Most of the time the darn customers don’t behave as you predicted. How Does Customer Development, Agile Development and Lean Startups Fit? Wait a minute, isn’t the Business Model the same thing as my Business Plan? Sort of…but better. A business plan is useful place for you to collect your hypotheses about your business, sales, marketing, customers, market size, etc. (Your investors make you write one, but they never read it.) A Business Model is how all the pieces in your business plan interconnect. How do you know your business model is the right one? When revenue, users, traffic, etc., start increasing in a repeatable way you predicted and make your investors happy. The irony is the first time this happens, you may not have found your company’s optimal model. Most startups change their business model at least once if not several times. How do you know when reached the one to scale? Stay tuned. More in future posts. The goal of your early business model can be revenue, or profits, or users, or click-throughs – whatever you and your investors have agreed upon. Most startups change their business model multiple times. I love the succinctness with which you explained it. Great stuff. I love that business model generation, slap canvas on wall and ideate idea. As a constant idea bootstrapper this idea works perfectly in my teams current, smother the wall with idea postits sessions already. Keep them coming. Hi Steve, I consider myself to be a disciple of your teaching :). I recently got my copy of Four Steps to the Epiphany. It is Twice as expensive in the UK than the US. I have a question about your definition of a startup. is there a difference between a company and a startup? Is it only the goal that determines it? Does size matter? e.g. funding, personnel, years of existence? Would you classify Facebook and a recent graduate of Ycombinator both startups? I wrote a bit on it here (http://oonwoye.com/blog/2010/01/10/what-is-a-start-up/) and I would like to know your thoughts on the questions raised. These posts under the Durant versus Sloan category explain it. Let me know if they don’t. Hi Steve–I know that I’m coming into this late, but the link doesn’t work at the moment; could you re-post? Thanks! This compliments Fred’s (avc) personal non-tech investment post today. The model is search, the costs are based on staffing needed to execute that search efficiently. The returns are estimates of any revenue generated while exploring functional models. Weaving these thoughts together into a practical tool for my startup should be a fun challenge. Thanks Steve. Excellent summary! I read The E-Myth last year, and this same concept is a big part of it, but your illustrations and definitive statements are crystal clear. Any thoughts on a business that has reached ‘transition’ without outside investment? Do you grow incrementally with the current model, or seek capital in order to explore (possibly unprofitable) extensions and permutations of the current model in order to optimize it? Subscribed to your RSS, BTW, looking forward to future posts. Congratulations on bootstrapping your company so far. Taking capital should be directly proportional on how big of a company you want to get. Nothing wrong with growing incrementally. Just a choice you get to make. My thought is that it’s one thing to create value, it’s a very different thing to figure out if it can make money. You can create something that has value but it costs more to create than it’s worth. It’s still valuable, but there just isn’t a business model to support it… or you haven’t found it yet. I like your definition. Thanks for sharing. Alex Osterwalder’s canvas does a picture perfect job in describing the business model, and it is interesting to see your elaboration of it to startups. Especially the part that aligns customer development process with iterative business model design. When thinking of methodologies, I have experienced that synthesis of process such as customer development and ontology such as the business model canvas can be challenging. I look forward to reading future posts on the subject. Business Model Canvas Poster V.1.0View more documents from Alexander Osterwalder. Hi Steve, great post. Nice and simple. A big challenge we see with the startups that we work with is that they take a while for the vision to get clear enough that it gets exciting enough to do anything about – then it’s too precious to change and iterate which is crucial as you point out. Our answer is to have a strong general vision about the customer you want to serve, what problem your solving and how that leads to something good for you (income, profit, buy out) and the rest is test test test. I think once you embrace the fact that your first thoughts on how it might work will definitely be wrong, then you’re more inclined to do something a lot more tight, focused and simple because you don’t want to waste resources building supporting stuff for something probably going to be wrong. And that’s a good thing. Most of the time a new tech based startup can actually have a lot of the first layers of testing doing without even writing a line of code. You can do it manually, do it by email/cold calls, do it with a free blog. It’s very rare that you need the full service up and running before you can create value. One quick point, the two images you use are a little hard to read. The Osterwalder one could use with darker text than the white on brown and other one is a little small. Both awesome, but thought you’d like the feedback. What would be a better safe business partnership model? Two individual entering as partners compared to these two individual having their own LLC and these LLCs coming together in partnership? analysing your startup’s definition i perceived that the ‘scalable’ concept does’t means the same as commonsense in which ‘to scale’ means achieve an enormous customer base. However, in your definition, scalable means to have a balanced and ‘healthy’ business model enough to develop the startup and makes it growth. (regardless of whether his strategy is ‘focus’ or ‘scale’). So scale is more related to “replicating their success rather than pursuing scale as the key to success.” (as can be read here:http://www.strategy-business.com/article/11204). I´m trying to start a biotech company based upon a research method which I developed in Heidelberg, Germany. How should I get started? I was hoping you could answer this question for me. If a startup is is an organization formed to search for a repeatable and scalable business model, what do you call new companies that are more ‘traditional’? Are the still considered startups? For example, if you are to set up a taxi company, or a shoe store (leaving aside the argument that with Halo / Uber and Zappos that these traditional business models may change in the future), and it’s a new company, is it still a startup? Their business models have been proven many times before. Nice article. I think everbody needs to try a startup. I feel sorry for us (brazilians). Because or governament it’s to sux and we pay a lot of taxes. But, I love what u write.